Client NE Vehicle Services & CSX Real Properties Inc.
TransDevelopment has served as development manager for this innovative greenfield project since 1994. 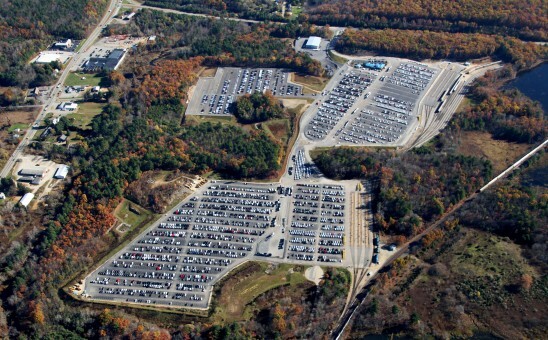 Acting for the landowner, operator and developer of the landmark facility, TransDevelopment conducted extensive planning and engineering studies at the site to meet stringent Massachusetts land-use and environmental requirements. Following Conrail’s sale of the adjacent mainline to CSXT, marketing of the gateway began in earnest in 1998. Two smaller, congested CSXT terminals close to Boston have already been closed following the New England Automotive Gateway’s successful opening in October 2004. The current facility includes 50 acres of paved vehicle yards, and loading, support and setout tracks capable of holding 240 railcars. Private switching is used to provide continuous service to a 30-railcar spot loading ramp alongside the CSXT mainline track. Additional phased expansions will eventually bring the terminal area up to 90 developed acres within the 232-acre industrial park. The Gateway project features state-of-the-art surveillance and security systems, a dedicated compressed air network to allow rapid train departures from the site, and a rail support and maintenance compound separated from vehicle handing areas.